Apparently I’m the last one to arrive at the Trentatre Rosso party… But I do rather enjoy a good party so better late than never, right? 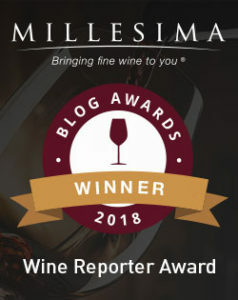 Previous vintages of the Trentatre Rosso by Santini Wines have been praised by quite a few fellow wine bloggers and frankly all of the publicity has me just that much more curious as to how good it could be. It was also highly recommended by the in-store Trader Joe’s wine representative who has assisted me in cherry-picking the best Trader Joe’s wines. The name Trentatre is of particular significance because it translates to ‘thirty-three’ in Italian. The reason for the namesake being that Trentatre Rosso is a blend of three different varietals, each representing 33% of the total composition. 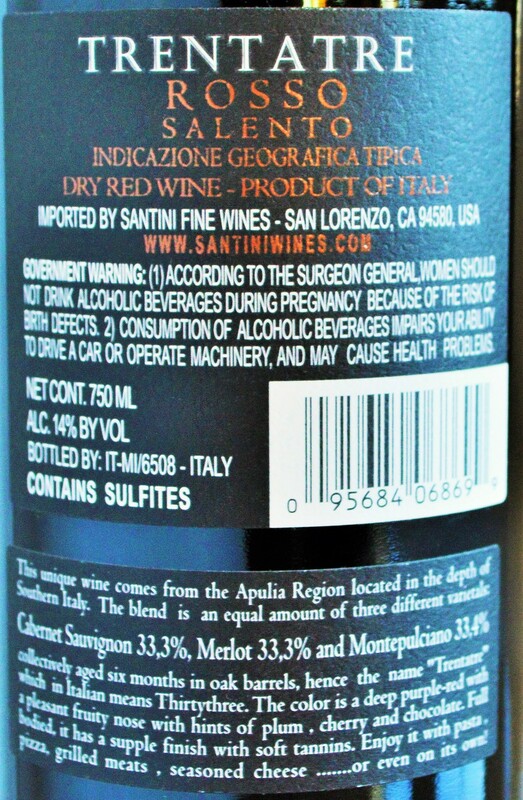 It also hails from Southern Italy, like the Grifone Primitvo, which was a solid value in the Trader Joe’s Wine Section. At under $7 let’s see if we have another winner on our hands with the 2012 vintage of the Trentatre Rosso 33! Nose: Its quite aromatic with a nose of ripe red and black fruit, chocolate, herbs and spice. On the palate: The Trentatre Rosso is quick to please with raspberry, plum, black cherry, blackberry and milk chocolate notes in a medium to full-bodied package. The mouthfeel is smooth and rich with a supple, dry and spicy finish. Should you buy? Buy as much of the Trentatre Rosso as you can afford! This is a stonking value that offers significantly more drinking pleasure than it’s modest price suggests. Simply put, I can certainly see what all of the fuss is about and frankly all of the publicity surrounding this wine is well deserved. 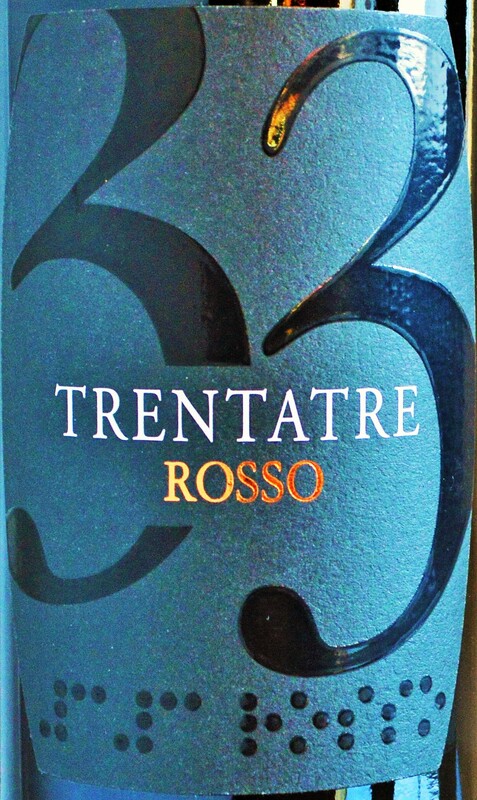 I will be stocking up on the Trentatre Rosso 33 personally on my next trip to the Trader Joe’s Wine Section! This is eminently quaffable with good concentration and a more refined mouthfeel than most wines in this price range. It further reinforces that when shopping in the Trader Joe’s Wine Section it is best to avoid the highly-commercial brand names and go off reservation with gems like these. The Trentatre Rosso might just become my new house wine! This entry was posted in Between $5 and $9.99 | Reviewed, Red Wines, Top Wine Values, Under $10, Under $100, Under $15, Under $20, Under $30, Under $50, Under $75 and tagged Best Red Wine under $10, Best Wine under $10, Santini Trentatre Salento IGT, Santini Wines Trentatre Rosso, Trentatre Rosso Salento, Trentatre Salento Wine on January 24, 2015 by The Fermented Fruit. I heard about this party from your site and just arrived. Opened a bottle tonight; will have to stock up tomorrow. This one’s good enough that it inspires a bizarre fear that it’ll all magically disappear unless I buy a case asap. Excellent. Thank ya! I’m glad you’ve made it to the Trentatre Rosso party, better late than never, right? It’s a really great bottle for the money. Luckily, every time I’ve been back to the Trader Joe’s wine section they have had it in stock. The 2013, now in stores, is a disappointment. Thanks for the heads up – that is disappointing! One of the better tasting wines for the price!